Happy Easter all! We woke up to some great news this morning – our good friends are about to be parents today – how fun that their baby is going to be an Easter baby. I had some Buttermilk in the fridge to use up from when I made Rachel’s birthday cake. 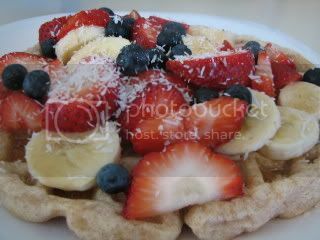 I used it this morning to make these Clear Conscience Waffles from EatingWell.com. I followed the recipe exactly except I added cinnamon and I substituted Organic Maple Flakes for the sugar. I LOVE Maple Flakes not just for their awesome taste, but, because they have half the calories of sugar. Plus they are a healthy alternative if you are trying to get the “white” out of your diet. I have bought them from igourmet as well as in bulk from amazon.com. I am not sure what we are up to today, but, I know I am going to be planning out our meals/shopping, fitting in a great run and cooking up some fun new recipes to share. I think a movie might be on the agenda too since we didn’t see it all on Friday night. Enjoy your Sunday and I hope you all are having awesome weather like we are – it’s absolutely beautiful outside and the doors/windows are open already. beautiful Easter breakfast, girl 🙂 Glad you enjoyed it! I’ve never heard of maple flakes – I’ll keep an eye out! They sound yummy. Jenny ~ Thanks – Happy Easter to you too. Jane ~ I was only able to order them online. They do not sell Maple Flakes in any store that I could find, but, do tell if you do find them somewhere.